The University of Washington, founded in 1861, is a public research university in Seattle, Washington, United States. Also known as Washington and locally as The U or UW (usually pronounced "U-Dub"), it is the largest university in the Northwestern United States and the oldest public university in Washington. The UW maintains three locations, with its flagship campus in Seattle's University District and branch campuses in Tacoma and Bothell. Its operating budget for fiscal year 2005 was $3.1 billion.he university is known as a Public Ivy, an American term for state-funded institutions of higher learning that "provide[s] an Ivy League collegiate experience at a public school price." In 1860, the Legislative Assembly of Washington Territory passed "An Act to Relocate the Territorial University" in Seattle, "provided a good and sufficient deed to ten acres of land, eligibly situated in the vicinity of Seattle, be first executed to the Territory of Washington for University purposes." Early in 1861 Arthur and Mary Denny, Charles and Mary Terry, and Edward Lander donated land on a forested 10-acre knoll overlooking Elliott Bay. The University was established there, on the site of what is now the Fairmont Olympic Hotel on University Street in downtown Seattle. The Territorial University of Washington opened November 4, 1861. The fledgling University was little more than a backwoods school, which closed for lack of funds several times during its earliest years. The first faculty consisted of one professor who taught a curriculum that included Latin, Greek, English, history, algebra, and physiology. Washington became a state in 1889, and by that time the University was firmly established as an institution of higher education. Growing enrollment and the lack of available land in what was becoming downtown Seattle soon made a larger campus necessary, and in 1895 classes opened in Denny Hall, the first building on the present Seattle campus. In 1909 the University of Washington was the site of a world's fair called the Alaska-Yukon-Pacific Exposition. The exposition opened a new period for the University, as national attention was focused on it and the Pacific Northwest. Since World War II, the UW has earned an international reputation for its research and graduate programs. It is a leader in a variety of fields. Research is of great benefit to the broader community, and undergraduates benefit by learning from professors who are at the forefront of generating new knowledge. The UW's graduate programs are among the most highly rated in the nation. The University is governed by ten regents, one of whom is a student. Its most notable current regent is likely William H. Gates, Sr., father of Bill Gates. The undergraduate student government is the Associated Students of the University of Washington (ASUW) and the graduate student government is the Graduate & Professional Student Senate (GPSS). Public research university, with campuses in Seattle, Tacoma, and Bothell. In 2006, the University of Washington research budget passed the $1 billion milestone Virtually all of the funding came from peer-reviewed research proposals. UW research budget consistently ranks among the top 5 in both public and private universities in the United States. 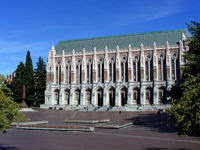 UW is also the largest recipient of federal research funding among public universities and second among all public and private universities in the country, a position that the university has held each year since 1974.The university is an elected member of the Association of American Universities. Among the faculty, there are eight Nobel laureates (another three among UW alumni), 57 members in the National Academy of Sciences, 15 members in the National Academy of Engineering, 44 members in the Institute of Medicine of the National Academies, and 56 members in the American Academy of Arts and Sciences. Overall, the faculty is ranked fourth among public institutions with National Academy members and fifth in national faculty awards. 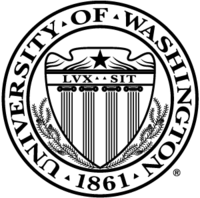 Additionally, the UW faculty has eleven MacArthur Fellows, 13 Howard Hughes Medical Institute Investigators, eight Gairdner Foundation International Award winners, five Lasker Award winners, 11 MERIT (Method to Extend Research in Time) Award winners, 19 PECASE (Presidential Early Career Awards in Science and Engineering), four American Philosophical Society, one Fields Medal, two National Book Award, one National Medal of Arts, five National Medal of Science, two Pulitzer Prize and one Academy of Management Hall of Fame Gold Member (another one among UW alumni) holders. UW is also the host university of ResearchChannel program, the only TV channel in the United States dedicated solely for the dissemination of research from academic institutions and research organizations.Current participation of ResearchChannel includes 36 universities, 15 research organizations, two corporate research centers and many other affiliates. UW also disseminates knowledge through its proprietary UWTV channel and online. I clicked on the link for "Washington University" and instead arrived at the page for University of Washington. U-Dub is a fine public university, one of the best on the West Coast, but it is not in the same league with Wash U.